Who said the public sector can’t maintain a fun, approachable digital presence? Employee recruitment is a serious and critical component of your talent management strategy, but that doesn’t mean you can’t use modern tools and dynamic approaches to identify and engage top talent. Instagram is a valuable social media platform for more than sharing post-workout meals and vacation photos of flip-flop clad feet in front of oceans of blue waves (trust us). It is a tool that should be used by all private and public sector recruiters to engage the next generation of local government employees (read: Millennials). Follow our tips to get started and make Instagram a key component of your recruitment strategy. As of June 2018, Instagram had topped one billion users. No, that’s not a typo. That’s one billion with a “B.” Only Facebook and YouTube currently boast more active users. If you’re under the impression that it’s only teens and tweens using Instagram, know that while the platform does skew younger than Facebook and LinkedIn, 33 percent of Instagram uses are between the ages of 30 and 49, and 70 percent have a post-secondary education. Not only is Instagram a critical platform for brands and recruiters due to the size of its membership, it has been called the “happiest place on the Internet.” Instagram users like over 4.2 billion posts per day. Unlike Facebook that is often used as a platform for individuals to vent and share unhappy life moments and has taken a dip in user trust due to recent scandal, Instagram is all about beautiful images, uplifting life moments, and brands that make peoples lives better. This naturally cultivated positive atmosphere makes Instagram the perfect place for local governments to share everything that makes their community special and unique while recruiting prospective talent. If you’re ready to get started instagraming your way to talent pool success, then begin by following these six best practices. 1. Be Authentic. Individuals who spend time on Instagram are looking for an authentic, visually appealing, emotionally uplifting experience. They are not interested in spam, pushy ads, or whiny memes. 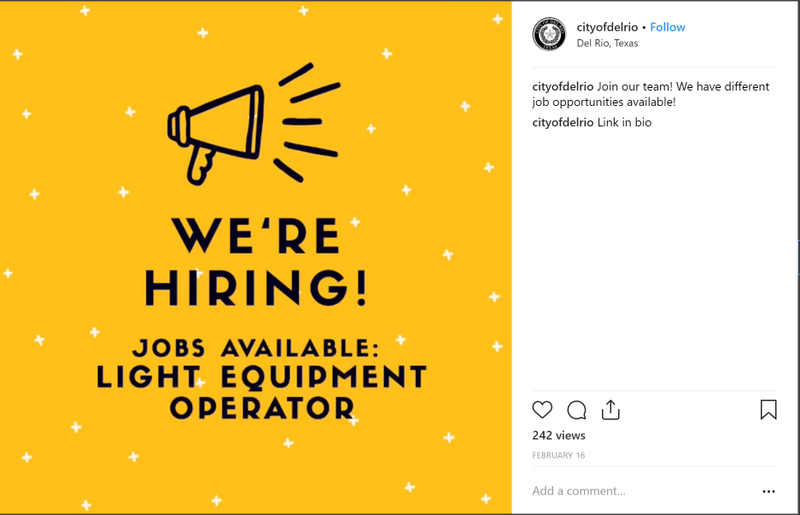 Use your human resource department’s Instagram account to paint a visual picture of what it would be like to work for your local government administration. Post photos of your employees engaging in community events, showcase your office and your people and reinforce the value of public service. 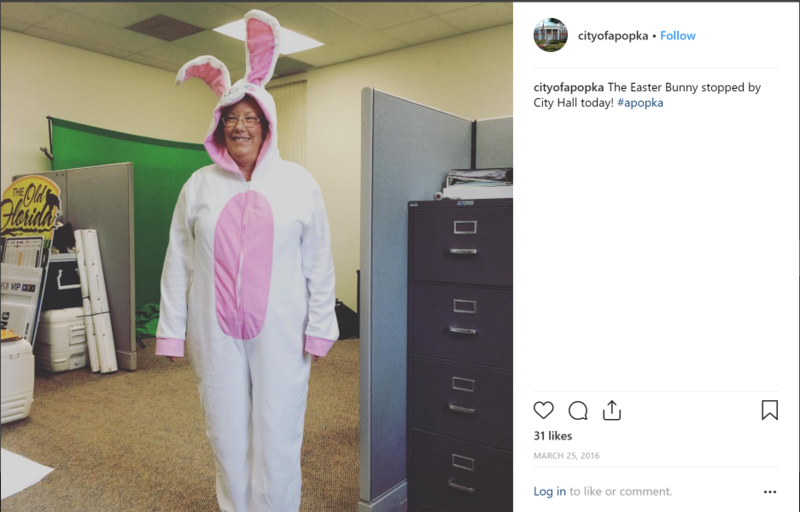 You can recruit prospective talent without even having to use the words, “apply now.” In the example below, the City of Apopka, FL shares a fun moment from inside its offices. 2. Make it Personal. Consider using your personal Instagram account for professional recruitment. Share posts that reflect the work you do hiring and retaining top talent in your community, and mix in some other moments of community and citizen engagement. People like to follow other people on Instagram, often more than they value following brands. As an HR director, you are already the face of your department. Promote the steps you take to find and hire the best, and soon they will come to you. 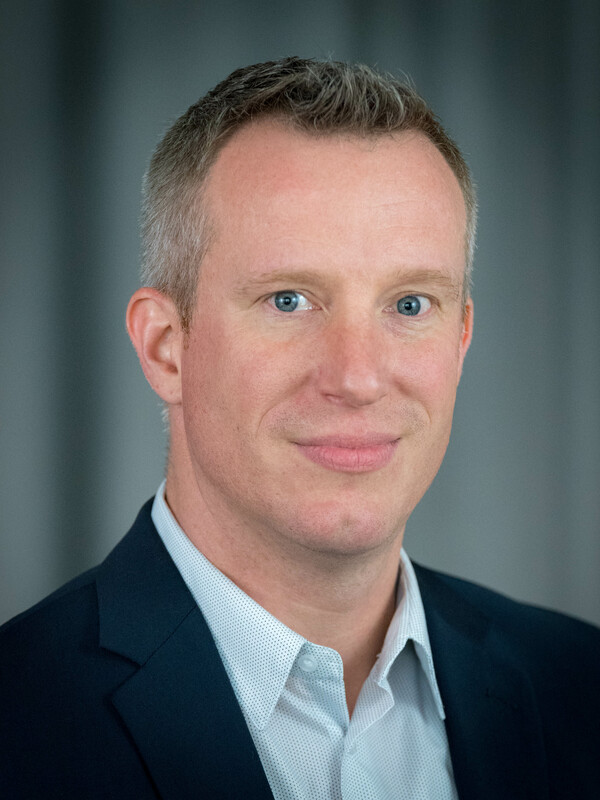 Civic Tip: Watch our webinar, hosted by CivicPlus Recruiter James Johnson: Top Talent Acquisition Secrest. Job Descriotions vs. Job Ads. 3. Use Hashtags. Hashtags are a tool that can be used to associate an Instagram post with a specific theme to make it identifiable by those who are not already following you, but that may be interested in community related topics. Consider adding your community name as a hashtag to your posts, and other civic-minded sentiments such as #community, #local, and #service. Feel overwhelmed by the #hashtag? Click here for everything you need to know about using these funny but essential text tools. 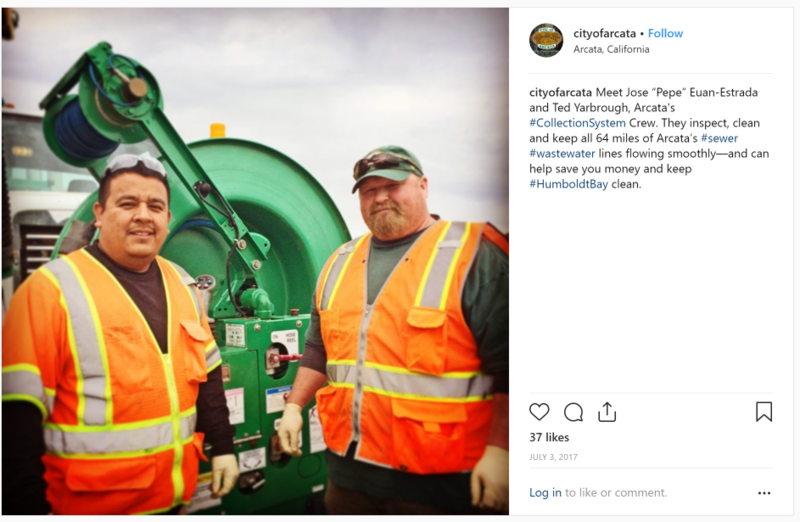 Then check out how the City of Arcata, CA weaves hashtags right into its posts while promoting its hard working employees. People: New hires, in-office birthday celebrations, work anniversaries, and holiday events. Employee events: Charity events, office potlucks, presentations, employee training, and engagement in parks and rec activities. The Community: Beautiful photos of your parks, downtown retailers, office buildings, and any other signature spots in your community. 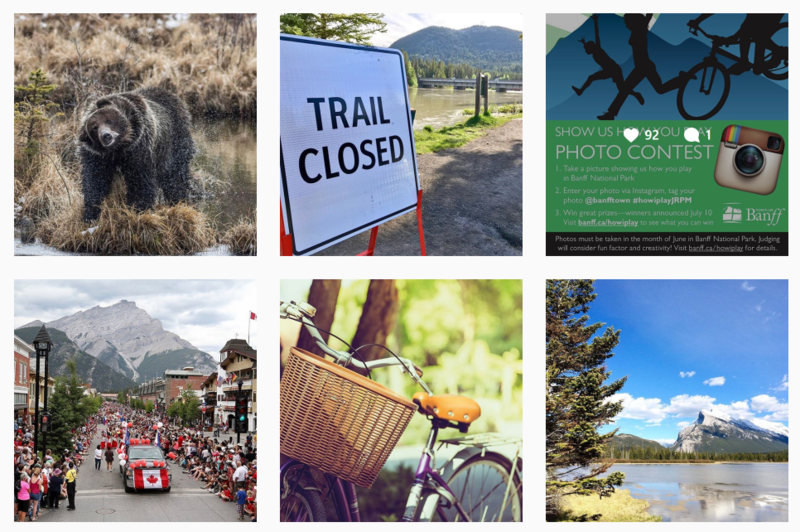 Check out how Banff, Alberta reflects a diverse range of photos in its Instagram feed. In the group of posts below, it uses Instagram to promote a contest, warn of a trail closure, highlight community events, and share beautiful shots of local scenery. In a community this unique, it’s never the same-old photos. 5. Incorporate Video. Instagram allows for the sharing of both live and recorded videos. Leverage this type of dynamic content to promote your recruitment by sharing live or recorded videos of community events, interviews with local leaders, introductions to new hires, and promotional videos. 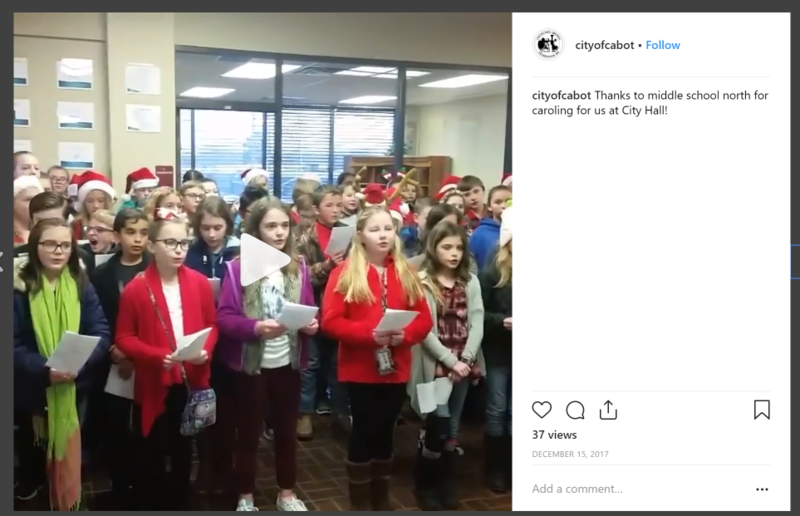 In the post below, Cabot, AR shares a video of local middle school students caroling at City Hall. 6. Add Links. As part of its effort to cultivate a more authentic, and less marketer-influenced space, adding a URL to an Instagram post does not create a hyperlink that a user can click on to redirect to a webpage. However, when promoting job opportunities, be sure to include your careers page’s URL as a cue for users to search your human resource employee management system for open positions. Or consdier taking a cue from the City of Del Rio, TX and tell users to click on the link in you bio to go directly to your employee management systems’ homepage.